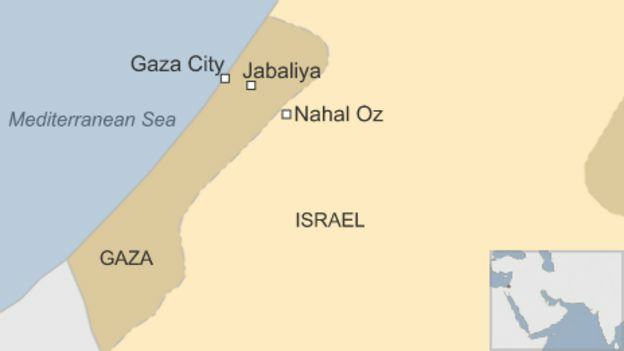 The Israeli military has disabled a major tunnel dug by militants which reached into Israel from the Gaza Strip, officials say. Defence Minister Avigdor Lieberman said it was the longest and deepest tunnel of its kind Israel had discovered. A military spokesman said it had been dug since the 2014 Gaza war, when Israel destroyed more than 30 tunnels which it said were meant for attacks. Israel is using sophisticated measures to thwart tunnels dug by militants. Military spokesman Lt Col Jonathan Conricus said the tunnel had been dug by Hamas and began in the area of Jabaliya in the northern Gaza Strip. He said it penetrated several metres into Israel in the direction of Nahal Oz, but did not yet have an exit. 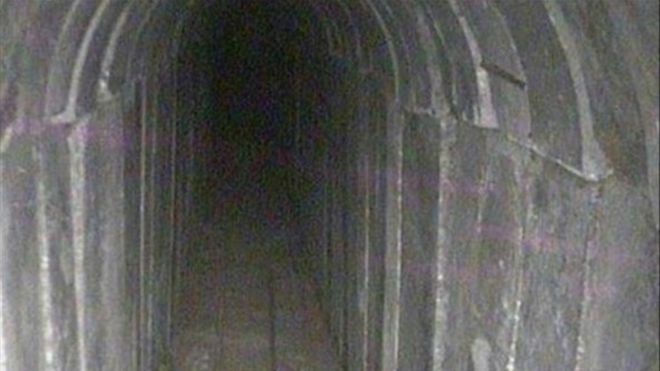 The tunnel stretched “several kilometres” into Gaza and connected with other tunnels from which attacks could be launched, he said. Israel disabled the tunnel over the weekend, according to the military. “We filled the tunnel with material that renders it useless for a very long period of time,” Col Conricus said. It was the fifth Gaza tunnel to be destroyed by the Israeli military in recent months, Col Conricus said. Some of the tunnels have been built by Palestinian militant group Islamic Jihad and others by Hamas, the Islamist group which controls Gaza. Since last year, Israel has been using special equipment to detect the presence of tunnels, and is building a hi-tech barrier above and below ground along its border with Gaza to prevent new tunnels being dug. The Israel air strike Saturday night, Jan. 13, in the southern Gaza Strip was aimed at a terror tunnel running 180m into Israel that Hamas was building under the Kerem Shalom crossing through which convoys of goods pass from Israel to the Gaza Strip. It also ran into Egyptian territory under the Rafah border between Gaza and Sinai. This was disclosed early Sunday by the IDF spokesman. He noted that Israeli fighters hit the tunnel at the Gaza end. Work to finish its demolition continued Sunday. The new tunnel ran under the gas and heavy oil pipelines through which Israel supplies the Gaza Strip population with fuel. This was the third Palestinian terror tunnel Israel had discovered and destroyed in the Gaza Strip in recent months. Hamas and the Iranian-backed Islamic Jihad were responsible for the first two. DEBKAfile adds: Clearly the IDF has been able to develop the technology for detecting and destroying the terror tunnels, so robbing Palestinians of one of their prime weapons of terror against Israel. Hamas will also have understood that Israel gave Egypt prior warning of its air strike Saturday night. This prompted the night curfew Cairo imposed on northern Sinai including the Rafah region an hour earlier. The tunnel network is also Hamas’ main conduit for smuggling arms and combatants into and out of the Gaza Strip through Sinai. Now that the Gaza Strip is under total land blockade, the Palestinian terrorist group faces hard options: Accept Egyptian and Fatah terms for reconciliation, launch a massive rocket attack on Israel, or call on the help of its allies Iran and Hizballah for action to break the blockade and deliver funds and weapons that can overwhelm the IDF and its new anti-tunnel technology. In the same week that Hamas is celebrating the 30th anniversary of its founding and Israel is marking the 30th anniversary of the start of the first intifada (1987), Hamas finds itself facing a multifaceted crisis. It has ceded government control of Gaza to the Palestinian Authority, it continues to be isolated internationally and Israel’s missile defense system has successfully neutralized 89% of the threat posed by rockets to the Israeli homefront, based on Defense Ministry figures from Protective Edge. Now the tunnels are slipping out of its hands as well. Hamas will have to reinvent itself if it wants to remain relevant. Given its current conditions and the means at its disposal, it will be especially difficult to do. There were no loud explosions, and no plumes of black smoke rose along Israel’s border with the Gaza Strip. The latest Hamas tunnel was discovered weeks ago using advanced technology developed by Israel. The Israel Defense Forces (IDF) kept news of the tunnel secret until completing preparations to neutralize it with innovative methods. It is worth remembering that the last time the IDF destroyed a tunnel dug by the Palestinian Islamic Jihad movement it failed to realize that members of the terrorist group were inside it at the time. Despite efforts to extricate survivors, the demolition of the tunnel resulted in the deaths of 12 Islamic Jihad and Hamas fighters and almost led to a major conflagration. This time, the tunnel was neutralized in absolute silence. Liberman’s comments prompted a series of public statements by top Israeli officials that after investing unlimited resources and the extensive efforts of the country’s finest minds, Israel has managed to remove the threat of the tunnels, which have kept the people of the south up at night for the past few years. The truth is much more complicated, though there is no doubt that Israel is getting closer to achieving this capacity. As of now, this approach is effectively keeping Israel’s border with the Gaza Strip sealed. Israel estimates that in the near future it will be able to eradicate the existing tunnels entirely and make it impossible to dig new ones. The Hamas tunnel destroyed this week was especially long, stretching several hundred meters into Israel. Israeli officials say that it was intended to allow Hamas to strike behind IDF lines in the next round of violence, just as the group attempted to do during Operation Protective Edge. Now Hamas has been denied that ability. The movement developed its underground strategy to gain an advantage over the IDF, but that advantage is decreasing rapidly. This development is forcing Hamas to confront a strategic dilemma. Should it accept the existing situation and search for new ways to attack Israel, or should it act quickly to take advantage of whatever tunnels it may have left before it is too late to use them? Israel’s approach to this operation was based on three components. The first, shielding, consists of a vast underground cement barrier being built along the border that should eventually encompass the entire Gaza Strip. The wall extends several dozen meters underground, and experts say that there is no way to dig tunnels beneath it. The wall is outfitted with sensors and other technologies to detect other tunnels and identify new excavation efforts. The second component, intelligence, involves using all means at the disposal of Israel’s defense establishment — HUMINT (human intelligence), SIGINT (electronic signal intelligence) and others — to learn where and when militants are excavating tunnels. The IDF has told Al-Monitor that Israel has put together a very good picture of what is happening on the ground. The third component, technology, includes the major innovation that enabled Israel to locate the two tunnels in the past two months. It was an integrated effort by all of Israel’s defense industries. The Defense Ministry’s Administration for the Development of Weapons and Technological Infrastructure set up a lab near the Gaza Strip for the country’s finest minds to tackle the problem. Will there be parades in Gaza and Ramallah for the terrorist who committed bloodshed in Manhattan today? Only we regret. I get it, we’re Jewish. We are supposed to be different. We are supposed to be better. Maybe, as I’ve written elsewhere, we should be worse once in a while, and then maybe they’d leave us alone. A few days ago the Israelis found yet another terror tunnel leading into Israeli territory and thinking it was empty, blew it to smithereens. Turns out that there were people still inside busy as beavers, terrorists from Hamas and Islamic Jihad. So the blast, bingo, eliminated them too, about 20 of them, half sent directly to their 72 virgins, the other half injured. I get conflicting numbers between the naked and the dead, but within Israel there’s a larger conflict going on even as we speak. First, the world’s leading Islamic terrorist, Mahmoud Abbas, left his EU and US- funded multi-million dollar bunker to proclaim his outrage. The Israelis, he said with a straight face, have no right to use deadly force against terrorists. Jews have no right to protect themselves…and according to that line of depraved thinking, New Yorkers are likewise open season as we saw from Tuesday’s ramming and shooting attack in Manhattan. That is not news. We expect that from the man behind the Klinghoffer and Munich Olympics massacres. But it is news when the IDF seems to explain that it never intended to hurt anyone. This has sparked controversy as it amounts to an apology. Since when do we – meaning any sovereign nation – apologize for killing the enemy? In fact it is a command that when he comes to kill you – which is what these tunnels are all about – you are to get up early and kill him first. In every other country, that’s a good day when even by accident you’ve taken out your attackers. Lucky shot. But this is Israel and Israel is Jewish and old habits die slowly. Jews always apologize. Some may remember Tom Wolfe’s “Radical Chic” article in New York Magazine. That was about a group of Black Panther types who attended Leonard Bernstein’s big shindig to celebrate Black Power. The (Liberal) Jews at the same soiree were blamed for everything – and apologized for everything. Everything! Never mind that from the start the Jews were at the forefront of the Civil Rights Movement. So now there’s a flap within Benjamin Netanyahu’s cabinet. One says that the IDF was wrong to apologize; the other says, leave the IDF alone. Criticism against the IDF will never come from me. But I must say this; the response comes across as pathetic…an uncalled for justification in the fog of war. Sorry for what? Do they apologize to us? They give out candy and build statues to their murderers. They celebrate after they kill. Sorry we got to them before they got to us? The evidence, I explained, proves otherwise. But if so, it’s about damn time. I’ll take militaristic any day against 2,000 years of sitting-duck passivity. Yes, I will take militaristic whenever it is between them and us. Pressure on Israel from the Arab world to reopen Temple Mount and its mosques for Muslim prayer without delay has been strongly countered by the Israeli police and security authorities. They need more time to complete their investigation of the scene of the terror attack, Friday, July 14, in which two Israeli officers on guard were shot dead and a third injured. The three Israeli Arabs who committed the murders were shot dead in the subsequent firefight outside the Dome of the Rock. The Israeli government also decided that the shrine, which is sacred to three monotheistic faiths, needs better security installed before it is judged safe for worship and visits. Saturday night, the Netanyahu government Saturday nevertheless ordered Temple Mount opened Sunday “in stages” – which gives the police and security authorities a little breathing space. The police have been combing through the “scene of terror,” to reconstruct the crime and discover the secret arms caches hidden there. This undertaking is vast, complex and exceptionally sensitive. The Temple Mount surface platform is 150,000 sq. meters in area with nine ancient open gates. It stands atop 13 historic periods of construction and destruction, each of which has left layer upon layer of mostly unexplored tunnels, pipes, caves, pits, shafts and debris. Even archeologists working there for decades and the clerical staff of the Waqf authority in charge of Muslim rites there can’t claim to have explored all the warrens hidden under the paved surface. It is also suspected that there may be secret underground channels running under the Temple Mount wall and leading outside the compound. The police are meanwhile keeping their cards very close to their vests. They have detained some Waqf officials on suspicion of a connection with the terrorists, without releasing figures, and discovered a quantity of firearms. But the cops, unfamiliar with this unique ancient site, don’t know what they will find. They are after information about the identities of the party which instructed them to hide the two rifles and pistols used by the terrorists and said when they should be handed over. In short, whether a terrorist network exists on Temple Mount. Relatives of the three terrorists, who belonged to the same clan in the Israeli Arab town of Umm al-Fahm, have been detained in search of information about how they came to perform the first act of terror by Moslems on Temple Mount. Most of the town and other parts of the Arab population are hostile to the investigation. Israeli Arab community leaders, including their 13 parliamentarians, have refused to condemn the attack, willing only to voice regret for all the deaths inflicted Friday, including the three assailants. This was resented not only by Israelis at large, but most bitterly by the Druze community, which buried two of its sons, Hail Stawi, 30, from Maghar and Kamil Shanan, 22, from Hurfeish both in northern Israel. They were shot to death while guarding the holy site. The Temple terror investigation has exposed troubling animosities in Israeli Arab society. A top Egyptian officer was gunned down in front of his home north of Cairo just after dawn Saturday in another sign of the increasing conflict between the government and its opponents – both armed and unarmed. The Lewaa Al-Thawra (Revolution Brigade) claimed responsibility for the assassination of Major Adel Ragaai, head of the Egyptian Ninth Amour Division – the unit charged with destroying the tunnels running between Egypt and the Gaza Strip. The Brigade made its debut in August with an ambush on a police checkpoint in Sadat City – an attack that killed two and injured five others, including two civilians. Ragaai’s wife, Samia Zein Al-Abdeen, is a defense correspondent for the state-owned daily Al-Gomouria. The newspaper quotes Al-Abdeen as saying she hurried outside when she heard a burst of gunfire from a private vehicle as it sped down their suburban street. “From the discourse in their statements and the music in their propaganda videos it’s clear Lewaa Al-Thawra is closer in orientation to the Muslim Brotherhood than Islamic State,” said, Abdullah Kamal, an independent expert on jihadist groups in Egypt. Ragaai’s death is the first political assassination of a military figure since former President Mohamed Morsi was removed from office by Egypt’s military in 2013. Since that year, the Egyptian military has destroyed more than one thousand smuggling tunnels, a key lifeline for what remains of the private sector in the Gaza strip. The tunnels also serve as a conduit for a busy cross-border arms trade that provides revenue and ammunition for the Palestinian Islamist group Hamas. Ragaai oversaw a massive operation that began last year to dig a canal parallel to the Rafah border, flooding the frontier with sea water which seeps into the tunnels, preventing their use. Hamas officials in the town of Rafah complain that Gaza’s limited fresh water aquifer is being rendered undrinkable as well. Ragaai ‘s assassination was preceded by an attack on security personnel in nearby Al-Arish Friday. The Interior Ministry said two police officers were killed as their vehicle ran over an improvised explosive device. But security officials were eager to point out that they are on the offensive in the pocket of the northern Sinai where most incidents of Islamist violence are concentrated. “Our forces killed 21 terrorists, destroyed over twenty of their hideouts and were able to locate and disable 16 IEDs before harm came to our men,” said an Interior Ministry spokesman. The battle against the Muslim Brotherhood has intensified in Egypt’s courts as well. Cairo’s Court of Cassation rejected an appeal Saturday by the ousted former president Morsi against a 20-year prison sentence for a 2012 incident that the state charges led to the deaths of 10 people in clashes outside the Ittihadiya Presidential Palace. The Ittihadiya case is one of several indictments still pending against Morsi which include charges of espionage on behalf of Qatar and of organizing a jailbreak in conjunction with Hamas. Egypt’s Central Agency for Public Mobilization and Statistics reports that annual inflation is the highest it’s been in nine years and foodstuffs ranging from sugar to baby formula to cheese have become scarce on the shelves as suppliers are unable to find foreign currency to pay for the products. An intensified American critique of the Egyptian security state’s battle against the Brotherhood is adding to the headaches of the top brass in Cairo. On May 25, 2016, the Lebanese daily Al-Safir, which is known for its support for Hizbullah, published a front- page article celebrating “Liberation Day,” i.e. the 16th anniversary of Israel’s withdrawal from South Lebanon. The article, which appears without a byline, analyzes the current situation of Hizbullah (which it calls “the resistance”) as well as its combative actions on the Syrian and Israeli fronts. It claims that this year’s Liberation Day celebrations are mixed with heartbreak for Hizbullah supporters, due to the large number of Hizbullah casualties in the Syria war. It adds that in its fight in Syria, Hizbullah currently faces the toughest challenge since its establishment, greater even than its conflict against Israel, because the price thus far paid by Hizbullah in this war – both in capabilities and casualties – is unprecedented, and no solution in Syria is on the horizon. Adding that alongside its fighting in Syria, Hizbullah is continuing its activity against Israel, the article also reports that resistance fighters work day and night along the Israeli border, “conducting observations, preparing, and digging tunnels that cause the settlers and enemy soldiers to lose sleep.” It also states that in fighting “tafkiri organizations,” Hizbullah has encountered an enemy that excavates tunnels, after becoming accustomed to being the only one digging them; in fact, it was Hizbullah that taught other resistance fighters, particularly Palestinians in the Gaza Strip, the tunnel doctrine. “[Since its founding], the resistance [i.e. Hizbullah] never found itself deployed on several fronts and facing more than one challenge and more than one danger at once [as is happening today]. These four years since it became involved in the war in Syria represent the greatest trial it has [ever] faced… The movement has never paid in flesh, blood and abilities as it has paid [during the Syria war] and as it may continue to pay in the future, in the open confrontation with the takfiri [groups, i.e. the groups fighting against the Assad regime in Syria]. [So far] over 1,000 [fighters] have died and thousands have been wounded and disabled, and many others may meet [the same fate] in the ever-expanding confrontation that is becoming more difficult and more aggressive every day. This, especially since the horizon of a political solution seems to have been eliminated for the foreseeable future. “Amid all this comes the 16th [anniversary] of the liberation [of South Lebanon], which underscores an element that Israel cannot ignore, namely the strengthening of the security and stability equation on both sides of the Palestine-Lebanon border. [This is] thanks to the deterrence system, or more accurately the balance of terror, which is an equation that has turned South Lebanon into the most secure region in the entire Middle East. Though we must not ignore other factors, no less important, [that contribute to this security], including [UN] Resolution 1701, UNIFIL and the Lebanese army. “The heartbreak over the martyrs is a necessary tax [that must be paid] in the struggle, [a struggle] which the Lebanese, of all sectors, regard as existential, even though they are divided on whether the preemptive war against the terrorists outside the borders of the homeland is justified. This heartbreak is present in every home in South [Lebanon]… When Hizbullah secretary-general Hassan Nasrallah speaks at Liberation Day ceremonies [today] in the town of Al-Nabi Shayth in the Bekaa [Valley], he will be speaking to a public that has contributed to the resistance [by supporting Hizbullah’s activity in Syria] just as residents of the South have contributed [in fighting against Israel], and perhaps even more, since [Bekaa Valley residents] face a danger today on their eastern border that is just as bad as the Israeli danger. “The resistance also never experienced a four-year war in an area several times larger than Lebanon [itself]. It never experienced [war] against groups that imitate its methods and ways of warfare, but [who] instead of blowing themselves up against an Israeli convoy terrorize innocent people in the cities and villages, without batting an eyelash, as happened in the southern Dahiya or yesterday in Tartus and Jableh. “The resistance never experienced war against groups fighting in caves and in the hills, mountains, wadis and even deserts, as happened at Tadmor and in the rural areas of Homs and Aleppo… Before [the war with Syria], the resistance did not storm cities and did not fight armies deep in the mountains. Before this, no one lay in wait for it in tunnels like the ones that only it used to excavate, and [the doctrine of which] it spread to the rest of the men of the resistance, particularly to the Palestinians in the Gaza Strip. Regarding the issue of the tunnels, it should be noted that Ibrahim Al-Amin, chairman of the board of the Lebanese dailyAl-Akhbar, wrote in a January 13, 2014 article that Hamas members fighting in Syria, in the Al-Quseir area and other regions, had dug tunnels there, similar to the ones excavated by Hamas in Gaza. He explained that Hizbullah had taught Hamas to dig these tunnels in the days when the two organizations were cooperating in smuggling arms into Gaza and preparing military plans against Israel. Al-Safir (Lebanon), May 25, 2016. Hizbullah, like the Syrian regime, does not draw a distinction between the rebels and the Salafi-jihadi groups.